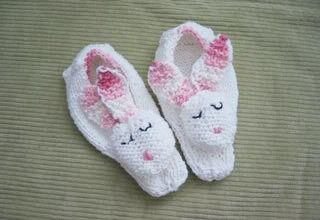 A charming pattern from Alison for a pair of child's slippers, first knitted for her niece, Nancy. Draw thread through remaining stitches and secure, leaving a long thread. Sew up the edges of the ribbed section to form the toe. The seam is centred along the top of the foot and will be covered later by the head. Heel - Pick up 10 stitches from middle of cast on row, leaving 18sts (9 on each side of the 10 you have picked up). You will pick up and incorporate these 18 sts as you work the back of the heel. Row 1: K9; pick up the next st of the cast-on row and knit it together with the last st of the row. Turn. Continue in this way for 12 rows in all. Row 13: Pick up at a st at the beginning and end of the row, knitting the picked up sts with the first and last st of the row respectively. Row 14: Pick up at a st at the beginning and end of the row, purling the picked up sts with the first and last st of the row respectively. Row 15: Pick up at a st at the beginning and end of the row, and K2 tog repeated across the row. Bind off remaining 6 stitches. In sewing the toe centre seam, and working the heel you have pulled up the sides to form the slipper shape. [Editor's note: If the 'cuff' of the slipper is loose you can work a row of single crochet around the edge of the slipper and pull in the shape a little. I used the pink for this.]. Head - knit 2 in white. Next row: Knit twice into every stitch [20 sts]. Work in garter stitch (knit every row) for 1.5 inches. Next row: K2tog across the row [10 sts]. Bind off leaving long tail. Using spare yarn, embroider a pink nose, and crescent shapes for closed eyes, using the picture as a guide. Loosely stuff head and use long tail to sew around edge and pull in making a small flat ball. Next row: Knit twice into every stitch [4 sts]. Work in garter stitch (knit every row) for 1 inch. Next row: K2tog across the row [2 sts]. Sew a white to a pink ear using blanket stitch. Finishing - Sew ears firmly to back of head at jaunty angle. Sew head to slippers covering the seam on the toe section. Tail - (optional) make 2 small pompoms and attach to heels of slipper. Dishcloth cotton - white and pink (Lily Sugar n'Cream cotton.). I used just over one ball of white and a scrap of pink. 1 pair 5mm needles. .
20 sts and 26 rows to 4 inches measured over stocking stitch on 4½mm needles. Fits feet 7" long (age 4 or so). To adjust the length - knit the plain stockinette section for longer. To adjust for width cast on more stitches, make sure you increase the heel pick up stitches in proportion.